Loyal blog readers (that would be you mom) already know that I’m a Cincinnati Bengals fan. And when they’re playing, I like to watch at a bar and eat some good bar food. So when a friend I hadn’t seen since high school, Mike, suggested we meet up, I was up for it, no matter where we went. I didn’t realize that we were going to a place that had been voted as the best wings in the city. Now, I wouldn’t call wings barmet. They are bar food. When done well, they should be simple and spicy. You try to fancy that up, you lose what makes it good. And I wasn’t the only one who thought so. Mike’s brother-in-law was there, and about 6 of his friends, and I swear I saw them order about 100 wings. No joke. But yeah, they were good. The wings were as good as the Bengals were bad that Sunday. With the Bengals, maybe next year, but I hope to get back to Bird’s Nest sooner. The Bird’s Nest boasts that its menu is not typical bar food. I say, time for a reality check, Bird’s Nest. I say, do what you’re good at. I say, be proud of what you are: a sport’s bar with a typical, albeit extended, menu. Okay okay, they do have a few – and I mean a few – more vegetarian options than most bars (hummus, stuffed mushrooms). I wasn’t a big fan of the veggie panini I ordered, but what did I expect? I was surrounded by hundreds of sports-tuned televisions and super fans pounding chicken wings. Go to Bird’s Nest if you want to watch football, hang out with your friends, eat wings and drink beer. If you’re looking for culinary excellence, Bird’s Nest is not the place to find it, but did I really need to tell you that? It is, after all, a neighborhood sports bar. As you may know, I’m fairly new to Chicago. That means I’m not a Bears fan. I know, I know. But really, with the way they’ve played this year, can you blame me? No, I’m a Bengals fan. And I’m trying to convince my beautiful girlfriend to bleed Bengal black and orange. This year, it hasn’t been hard. The Bengals are clearly superior, as evidenced by their 45-10 drubbing of the Bears. No, the hardest part has been finding the Bengals game on TV. Which brings us to Hophaus. We’d heard a rumor that you could watch any NFL game on Sundays, but that’s the only thing we’d heard. So when we went to the game one Sunday recently, we were simply hoping to watch the game and maybe have a beer or seven. (Well, maybe just me. She’s always looking for a fine culinary experience.) 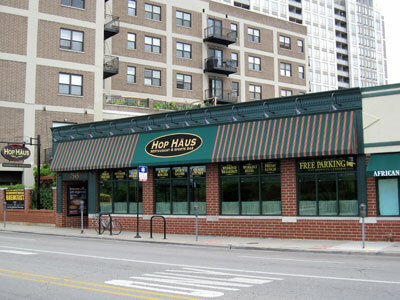 So we were surprised when we loved the menu and, well, pretty much everything about Hophaus. We walk into this huge pub, and I knew we were in a great place when I see a huge mural of sports figures. Not just Chicago sports figures, though I do believe I remember seeing Ditka in there. I think Pete Rose was in it as well, so I liked my chances for a Bengal victory. Or at least seeing the game. We told the hostess that we wanted to watch the Bengals game, and she put us in a spot that didn’t have a great view of the game. So we asked our waiter if we could move to another table. Oh, and could they put it on another TV? Great, thanks. Oh wait, this table of softball players is leaving and we just heard we have more friends coming? You don’t mind if we move, right? We may have been the most annoying table on that particular Sunday, but our waiter, David, was really cool about it. He even put the game on a couple more TVs for us. I always worry when we go into this sort of situation, for my girlfriends sake, that everything on the menu will have some sort of meat in it. Like every dip is made with a chicken broth, or they put bacon fat on toast instead of butter, and beef chili on top of their portobello mushroom sandwich. But as we looked through the menu, we realized everything looked good, and it seemed like 1/3 of the menu was vegetarian. I started things off with bloody mary, which was good. We then shared a spinach and artichoke dip, also good. Then things got interesting. I ordered a breakfast pizza, from their extensive selection of breakfast pizzas. I was amazed, I’ve never seen an extensive collections of breakfast pizzas. That’s like the marriage of two of my favorite things. I had a spicy chipotle pizza, with spicy chorizo and covered in a thin layer of scrambled eggs and topped with a chipotle sauce. It was delicious. It was also a lot of food, but so worth it. 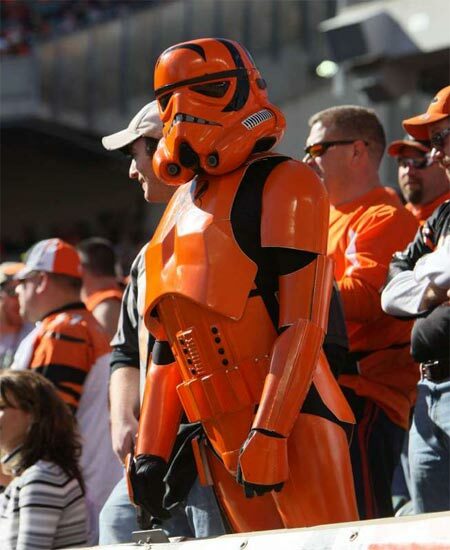 Oh, and the Bengals won. I admit, I was shocked at how much I enjoyed Hop Haus. I mean, it’s a sports bar that touts a selection of 24 burgers, many of which are made with creatures like ostrich and wild boar. Not my cup of tea. Or so I thought. They actually have an incredibly impressive selection of vegetarian and vegan options. Now, don’t get me wrong, you’re not gonna get a plate of steamed rice and raw veggies. Almost everything on the menu is decadent. 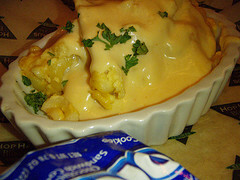 For example, the macaroni and cheese I ordered, pictured to the right, was ridiculous, even by my standards. 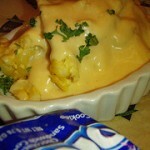 Already a cheesy mess, it was topped with a slab of Velveeta-like cheese that I definitely could have done without. Overall, though, this place rocks. There is absolutely something for everybody. In summary, go Bengals.